Here we are on day 5 of the 5 Things Blog Hop! Thanks for hanging out with me! Today I'd like to talk to you about making sure nature study becomes a regular part of your life. If you're new to nature study, it's important to build nature study into your routine and make a point of sticking with it until it becomes a habit. You know what I'm talking about. I start out every week with the best of intentions, but somehow, things happen and important things like nature study go by the wayside. While you're getting into a groove, make sure nature study happens, even if it means math (gasp!) slips a little. Spend some time outside every day. 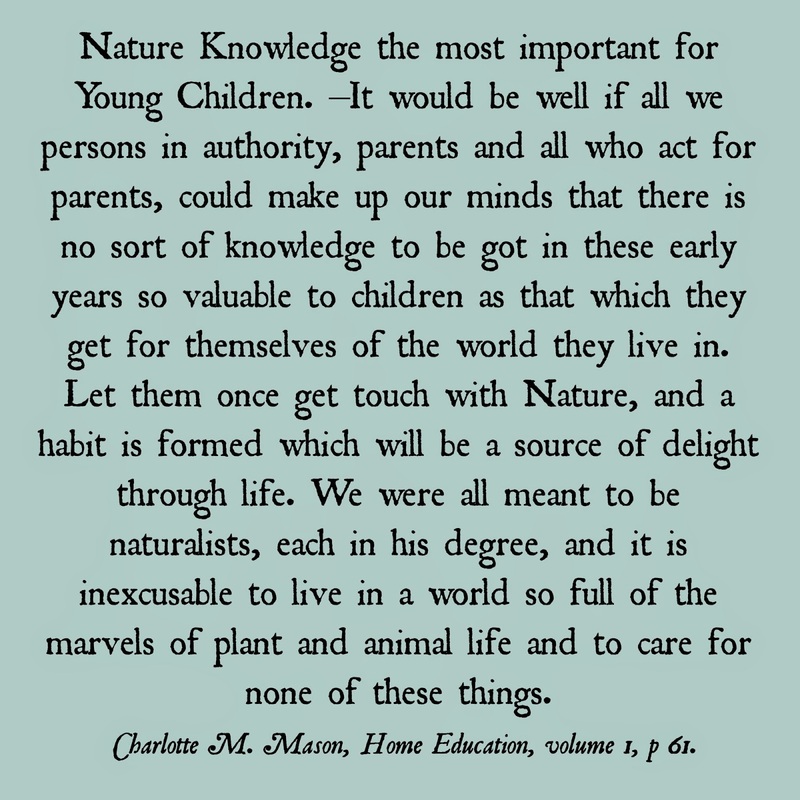 In a session on high school science at the Charlotte Mason Institute Conference a couple of years ago, the speaker told us she went outside every morning with her coffee and just observed. When she was done, she came back inside and recorded what she'd seen and heard in her nature journal. What a great way to record the seasons! Depending on where you live, you might have to get creative at certain times of the year. In North Carolina, it's extremely hot and humid in the summer. My fair-skinned redheaded beauties just cannot be outside during the hottest parts of the day. We have to go out in the early morning if we're going to go out at all. We can be outside nearly all winter, though, and some of you who live in colder places will have to think about how to get outside when it's really cold, even if just for a few minutes each day. 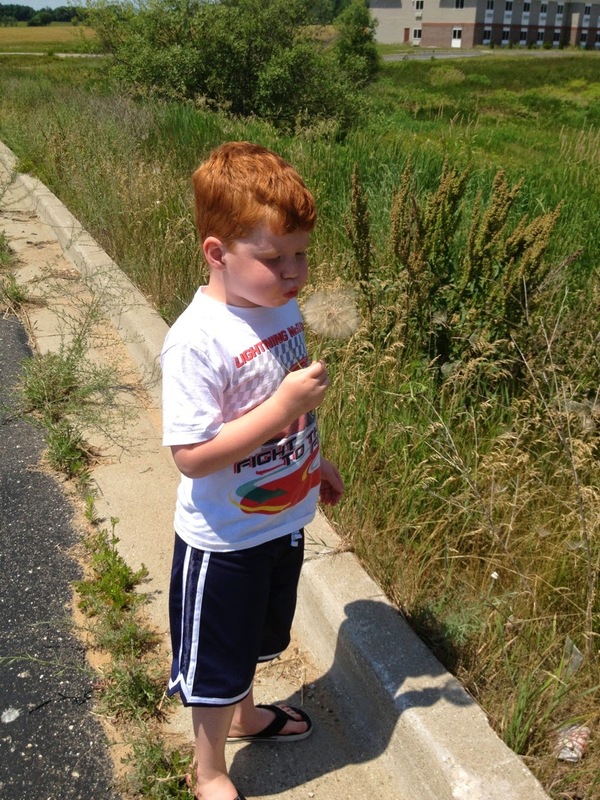 Schedule a topic for weekly, purposeful nature study. 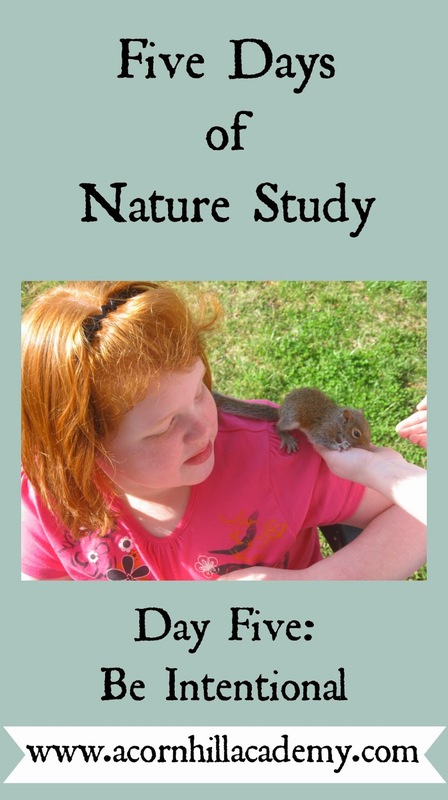 Nature study is different than a nature walk, Ambleside Online has a schedule laid out on their Nature Study page, and they have links to great information there. The Handbook of Nature Study website has the Outdoor Hour Challenges, and are a nice way to structure your studies. or being outside to see what you might find. You want to choose a topic and focus on that for a term. The easiest beginning study is probably birds. Birds live wherever you are. You can put up a small feeder and see who comes to visit. You could spend an entire year on birds alone! Find a new place. Is there a park close by? A pond or stream? Can you get to a nature preserve or botanical gardens? Perhaps there is a science museum with a butterfly house you can visit. It's worth making a special trip. Consider choosing one place and really get to know it throughout the year. What blooms, and when? What animals do you see? Are their migratory birds that only appear in the spring or fall? Mark off a specific spot in your yard, 1'x1', and observe what happens there throughout the seasons. What do you find there? Bugs? Grass? Flowers? Check out this Squidoo lens for ideas. I hope you've enjoyed our brief foray into the wonderful world of nature study. I will be sharing more on this topic soon. I hope you'll join me and share what you're doing! And, you can click on the banner to see everyone who's participating!